Citigroup (NYSE:C) announced its first-quarter results Monday before the markets opened, and Citigroup stock is down on the news. In spite of an earnings beat, a miss on revenue is causing the drop. First, before we get into the nuances of the report, let’s have a look at the key numbers. Analysts were expecting $18.634 billion in revenue. Citigroup delivered $18.576 billion, $58 million less than analyst expectations and 2% lower than in the same quarter a year earlier. On the bottom line, analysts were expecting earnings per share of $1.80 according to Refinitiv. The whisper number stood four cents higher at $1.84. Citigroup came in at $1.87 a share, seven cents higher than the consensus and 11% above Q1 2018. Excluding share repurchases, Citigroup’s adjusted net income increased by just 2%. Breaking it all down, Citigroup’s North American Consumer Banking segment saw revenues increase by 4% year over year due to healthy growth from retail services and branded cards. Its International Consumer Banking saw revenues increase by 3% in the quarter on strong Latin American results. Citigroup’s Institutional Clients Group’s revenue fell 2% in the quarter to $9.694 billion as a result of weak results from equity markets offset by solid results from investment banking. Net interest margin, the money it makes on its interest-earning assets, was 2.72%. That’s in line with analyst expectations, 3% ahead of last year and one basis point better than Q4 2018. Other possible numbers that investors are looking at? Citigroup’s efficiency ratio for the quarter — the amount it is spending other than the interest on debt to generate a profit — was 57%, the 10th straight quarter with an improvement. In the first quarter, its tangible book value per share was $65.55, 7.4% higher than a year earlier and 2.8% higher than in the fourth quarter. Excluding share repurchases, it declined 2.6% year over year and increased 0.33% from Q4 2018. 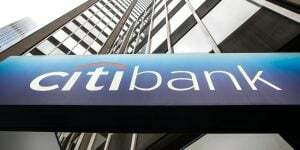 What Does it All Mean for Citibank Stock? Citigroup stock is up over 30% (including dividends) year to date. It’s on a big roll, sitting well off its 52-week low of $48.42. I don’t think you can characterize Citigroup’s quarter as particularly strong, but it did increase net earnings by 2% in the quarter despite weak equity markets, which suggests that its core business is still relatively active. Furthermore, it beat analyst expectations on a per-share basis by 4%. Over the four previous quarters, it beat the estimate by an average of 3.8%, an indication that the bank is pretty much where analysts expect it to be one quarter into a new fiscal year. Furthermore, it did generate a return on tangible common equity of 11.9%, barely missing its 2019 target of 12%, a positive if there ever were one. However, given that it missed on revenues, I don’t see much happening for Citigroup stock in the near term until some catalyst shows up in its business to drive it higher. If you’re long C stock, there’s nothing in the company’s report to change your mind. If you don’t own Citigroup stock but were thinking of buying, I don’t think there’s much to hang your hat on except that it’s on a bit of a roll. I’d wait for a bit of pullback. Article printed from InvestorPlace Media, https://investorplace.com/2019/04/citigroup-stock-delivers-a-predictably-boring-q1-earnings-report/.